My mother-inlaw is named Bonnie so I thought it would be cute to make a card with a big B on the front. The B would represent her initial but would also tie to into my sentiment inside which says “is for birthday!”. I cut a capital b out with my cricut and used it for the base on which I would place my quilled paper. I also used my cuttlebug to emboss a border on the top and the bottom of the card. The quilled portion took about an hour to complete. Posted in Any Occasion, Birthday Cards, Quilled Cards and tagged any occasion, birthday, cuttlebug, paper quilling, quilled cards. Bookmark the permalink. 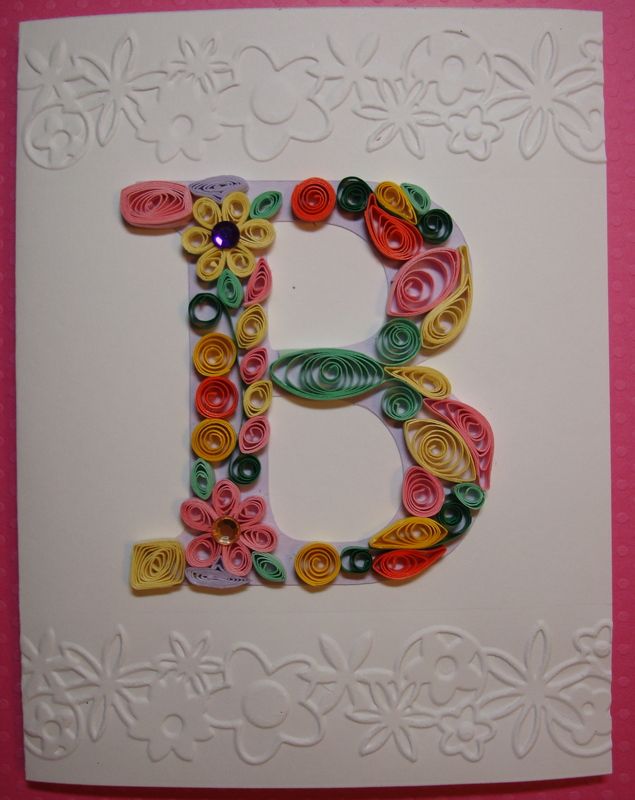 This is so cute… what a great idea to do the quilling in a letter shape.